What happens when you take a man who loves pickles and introduce him to a woman who loves pickles? They get married and have three (adorable) children, and not a single one of those (amazing) children will touch a pickle. Which means, of course, more for the man and the woman. I like to make dilly beans for lots of reasons. 2. Unless you add lots of acidic vinegar. 3. Dilly beans are delicious pickles that taste great all year long. And that's lucky, cause they last in jars all year long! 4. If you want to make something that really looks like you are a fabulous homemaker who shirks no duty and leaves no chore undone, these fit the bill. They just look the way canned food should look. I'm personally not much of a Bloody Mary gal, but I hear that they are a fabulous addition to a bloody Mary. I believe it. They are also a fabulous addition to a salad, or just on their own. I love to eat them nice and cold straight out of the fridge. First, trim the beans. You want to take off the tip and the tail, and you want to make them about an inch shorter than your jar. 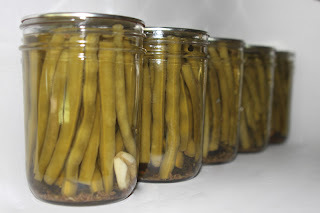 (There needs to be room for the liquid to cover them by a half inch, and leave a half inch of headspace in the jar). Put a clove of garlic and a sprig of dill in each jar. Divide the dill seed and peppercorns evenly between all the jars. 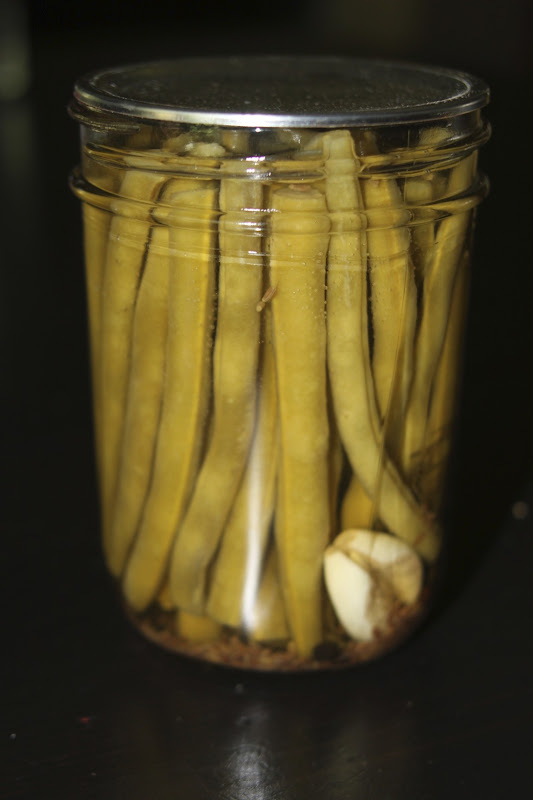 Pack the trimmed beans tightly into the jars, so they are standing up nice and neat. Combine the water, vinegar, sugar and salt in a non-reactive pan and bring to a boil. Pour over the the beans to cover them by a half-inch. 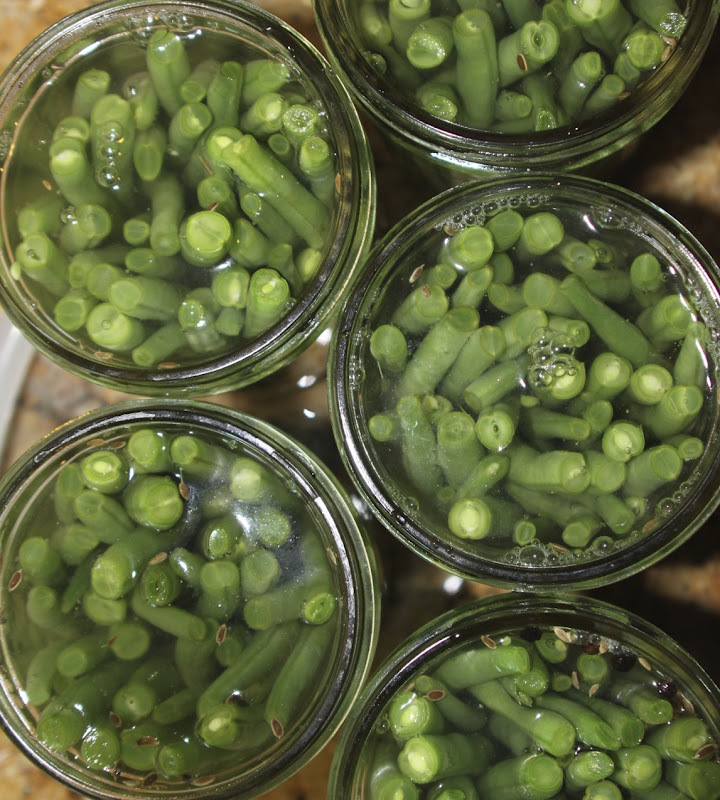 To can the jars, make sure to release any trapped air bubbles. Wipe the rims clean, place the lids, and screw on the bands. Boil for 15 minutes. Let the jars sit int he hot water for 5 minutes, and then let them sit undisturbed for 24 hours. These will keep for a year.